I decided this morning that I would try to extend my coverage of my commentary on air travel (and who knows maybe pick up a reader or two) and fired off this email to my MP, my MLA, the Prime Minister, several cabinet ministers, Senator Adams, and the leaders of the Liberal and NDP parties. I am a resident of Arctic Bay, on North Baffin Island in Canada's High Arctic. Given the amount of attention that the Arctic is receiving these days I thought you might be interested in some of the costs of living here. If the Federal Government really wishes to improve the lives of the people who live in the North they must address the issue that impacts absolutely every aspect of our lives up here, the cost of travel. The high cost of air flights (It costs me fifteen times as much per kilometre of travel to fly from Arctic Bay/Nanisivik to Iqaluit as someone flying from Vancouver to Halifax. Eighteen times as much per kilometre as someone traveling from Toronto to Sydney Australia) keeps all levels of government up here from fully implementing their programs, because of the amount of money spent on travel that could be used otherwise. Look at the total travel budgets of the GON and the Federal Government for Nunavut, and ask yourselves if this could not be money better spent. As a Canadian, my standard of living should not be significantly lower then Canadians living elsewhere in the country, and yet it is. Most of this can be laid at the feet of Air Transportation costs. There is much talk about sovereignty in the Arctic these days, but sovereignty is not built by Naval ships patrolling our waters for three or four months of the year, it is built on the lives of the people who live here. They should not have to pay significantly more than the rest of the country in order to keep living here, to keep this country's real presence in the north, and yet it does. I have written a couple of posts recently on the blog I write about life in the Arctic that you may wish to read. There are two that relate to Air Travel in the North, one a general one on air travel and the North and one with some cost breakdowns and comparisons. I think that you might be interested in what they say. In closing I really believe that it is time for the Federal Government to intervene in this issue. This is a social justice issue, and your dollars (and subsequently mine) could be better spent up here than lining the pockets of the airline industry. I encourage you all to fly up to Arctic Bay/Nanisivik, not by Government plane but by commercial airline (don't announce it or your frozen sandwich might be thawed first). Book the ticket yourselves rather than having an assistant do so, see what it is really like to travel in my world. When you are here, take a walk around our stores and look at what air freight adds to our grocery bills. So you want my vote do you? Apparently there is an election going on. Or two. Who knew? I have to confess that I'm not much of a political animal. I find it all off-putting. Party politics that is. I've long believed that the political party system is the biggest impediment to democracy that exists. Party politics have devolved into this apparatus that cares only about power and getting re-elected. If party x says "this", party y has to say "that", and it matters not whether "this" is an idea with merit. And the best person to represent my constituency might not get elected because his/her constituency doesn't want her party leader to be the prime minister? How does that best serve the electorate? I have no doubt that very few politicians start out by seeking nothing but power. I'm sure most enter politics with the best intentions only to get caught up in that nine headed hydra that is the federal (and most provincial) system. I'm sure that most think "I can't do the good I want to do unless I'm in (or keep) power" but that they are so busy try to gain or keep that power that the original goals are never looked after. I've never held membership in any political party, nor will I. And I've voted for members of all major parties (at least in their earlier incantations). Nunavut has a "consensus" style of government. There are no political parties, at least on the surface. Everyone runs, in essence, as an independent. You vote for the person that you feel is best for your constituency. Those elected get together to nominate and vote for the Premier. A cabinet is then chosen. Imperfect as it is, it at least better reflects true democracy than what the party system does, on its best day. I'm not going to get into the current territorial election, I can talk to both candidates pretty much anytime I want, tell them what from the government and find out where they stand on the issues that matter to me. Its not going to happen federally. I mean there is a chance that all of the candidates will visit Arctic Bay, but I doubt it. Lets face it this is a huge constituency, and we're a pretty small voting block inside it. Even if they all ended up here, with the party system being what it is, the people in their organization who really make the priorities, and who I should speak to are not going to come. Although one of them has ridden in my truck once, and I know that at least one of the other party leaders actually read one of my posts. Hey I'm a pundit. So, what is important to me? How can you (those of you running federally) do some good for Nunavumiut? Lets face it, why would you care, there are less than 30,000 of us, not much of a voting block? Well we have some unique issues, and part of your role should be to ensure that all Canadians enjoy a similar quality of life. Er, I feel safer, more sovereign and strangely poorer already. An interesting article appeared on CBC's news site the other day. Apparently the Canadian Government is buy several Unmanned Aerial Vehicles (UAVs), also known as drones, to patrol the Arctic. Now I'm not quite sure what their purpose will be, the article seems to be saying that they will be taking the place of Aurora manned aircraft currently patrolling the arctic. Which on the face of things seems to make economic sense, but not necessarily practical sense. It would seem to me that it would be hard to replace the human eyes you would have on board an Aurora, but what do I know. I'm not a military analyst. Some commentators have lauded it for bolstering Canada's Arctic Sovereignty claims. Now I've mentioned before that sovereignty is built on peoples lives. Lives lived in the area you're claiming as yours. Logically, if there is a legitimacy to making sovereignty claims based on the ability to conduct surveillance through automated, mechanical means, then we are in serious trouble. Several countries already take detailed images of Canada's north via their satellites. 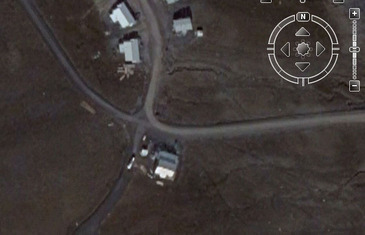 Heck, you can get a pretty good view of my house from Google Earth. I hope this doesn't mean that Google Earth has a claim up here, as much as I enjoy using their utility. Prime Minister Stephen Harper was in Nanisivik yesterday, to announce that Nanisivik has been chosen to be the new deep water port to service the new Arctic patrol fleet. The choice of Nanisivik as the port is the only logical one for the government to make. For one thing, it already exists. Nanisivik has been a deep water port, with fifty feet of water port side, since 1975. To construct a new port in Iqaluit or Resolute or elsewhere would be much more expensive and needless. It also is situate on the Northwest Passage, the only existing port on the Northwest Passage (there was a second on Little Cornwallis Island that was decommissioned when the Polaris mine was shut down. There will be people in Iqaluit jumping up and down saying a port should have been built there (give me a break, Iqaluit is about 600 nautical miles south of the Passage, and the costs of construction would be enormous), and apparently Churchill Manitoba (alright it has a port, serviced by a railroad to the south, but it is so far away you might as well use Newfoundland). There is also additional infrastructure at Nanisivik that makes it a logical choice (although not as much as there used to be). Fuel tank facilities, proximity of a 6,400' runway, and a utilidor for fresh water all still exist in Nanisivik. No, Nanisivik is the smart choice if you're needing a base for Arctic Patrol vessels. The only problem is the new scheme for Arctic Patrol vessels is the wrong approach to sovereignty. The Prime Minister is right when he says that when defending sovereignty you must "use it or lose it". As far as the waterways of the Northwest Passage go, Canada already uses them, and have for years. A fleet of Canadian Coast Guard icebreakers spend all summer in the Arctic waters. And more importantly, Canadian Inuit make use of the frozen and unfrozen waters, to travel, and hunt, and live. The Inuit have been living lives up here for thousands of years, long before there was a Canada, and now they are Canadians and their lives, and those of other Nunavumiut are the strongest possible arguement for Canada's sovereignty in the Arctic that there is. It has been long understood that it is people's lives that enforce sovereignty, it is the reason that the RCMP had detachments on Devon Island (the largest uninhabited island in the world) and on Ellesmere Island, policing no one but the people they brought with them. It is the reason for the poorly conceived and executed movement of people from Northern Quebec to Grise Fiord and Resolute Bay. It is the reason that the government should be doing as much as they can to make the Arctic a better place to live for the people who are here, and to attract other Canadians here. What can the Government do? First starters they need to have a long look at the price the airline(s) charge for airfares in the north. Flights from Arctic Bay (Nanisivik actually, as that is where our airport currently is) to Iqaluit, 900 kms south and our only direct destination apart from Resolute, cost $2,500. Flights from Nanisivik to Ottawa range from $3,700 to almost $5000. In less than six months, when Hilary no longer flies for free, the cost for our family of four to fly to see my family in Manitoba would cost at least $15,000, but likely closer to $20,000. And it not just that I want a vacation. The airfares impact on absolutely every aspect of our lives up here. If one of the stores needs to bring someone up to fix the coolers in the store (which I really wish they would do) that $2500 to $5000 gets added into my grocery costs. The cost of every teacher from the south includes the airfare from bringing them up, taking funds away from education programs, and the same thing happens on every in-service training that they have to attend outside the communities. Every time someone from the government flies into a community that takes away from money for their programs. I stagger to think about how much medical travel costs the Nunavut government each year, but you wouldn't be able to find a flight here that didn't have someone travelling to Iqaluit or Ottawa on medical. Think about your school sports teams and the opportunities that they have to play other schools. Now think about how often that would happen if you had to spend $2000 per athlete and the coach/chaparones. The costs of housing and other capital projects (such as the new airport) also includes the costs of flying in skilled people. There are so few business opportunities up here, and one that is trumpeted all the time is tourism. Think of the challenges in attracting people to a community like Arctic Bay, when it costs someone $3700 just to get here from the south. I could fly to Australia from southern Canada three times for that price. In fact I just looked, booking a flight from Toronto to Sydney return in mid-October cost $1424 with Air Canada, in fact I can get a flight and a weeks accommodation for $2500 from Vancouver. Imagine how much lives could be improved up here, with cheaper food, more money for medical and government programs if even an average saving of $1000 per flight were realized. There are four flights up to Nanisivik each week. When I flew last month there was 24 passengers on the flight. A young girl from Arctic Bay I met at the airport had been trying for three weeks to fly up on standby, so you can see the flight is usually full. So, some quick math would show that there are 96 passengers a week to Arctic Bay, or 4992 a year. The vast majority of those are travelling on government, medical, or business. A $1000 reduction in fares would mean almost $5 million more for programs or reduced food or other costs to this community alone. Oh, and just in case you don't think that $30,000 is enough revenue (24 pax times $1250 one way costs) to bring a Hawker the 900 kms from Iqaluit to Nanisivik (plus the $30,000 for the return flight), half the plane is carrying air freight, also generating revenue (and you don't want to get me started on the costs of air freight up here). So if the Government really wants to defend our sovereignty in the Arctic, save the 8 billion dollars on the redundant Arctic Patrol vessels, and make it worth Canadian's while to live up here. Oh and at the same time free up the Coast Guard to do community projects, such as mapping the family grave sites (and marking graves) that are scattered all over up here from when people lived on the land, making sites like the RCMP detachments at Dundas Harbour and Alexandra Fiord National Historic sites. Take some of that 8 billion dollars and create more housing and better infrastructure in the Arctic Communities. Our sovereignty depends on peoples lives lived up here.